In my first novel, The Lilting House, which I wrote in my twenties, I described my childhood as “a time of legends.” These legends were the stories the grown-ups told about their lives—in general and also specifically. One of the latter, which I heard every year, was the Legend of the April Snowstorm, and eventually I was the one telling it. I’ll repeat it once again now, as an April snowstorm blurs the windows beside my desk. 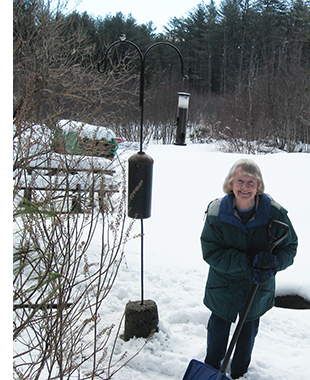 April snowstorms are common in New Hampshire, but this one was remembered because it occurred when my mother and I—a newborn baby, her firstborn—were scheduled to leave the hospital. (Well, I wasn’t exactly newborn; back in those halcyon days, mother and baby stayed in the hospital a lot longer, in this case two weeks.) My grandmother Ruth had come up from Massachusetts to help out at the farmhouse, and she and my father drove to the hospital to fetch my mother and me. The storm worsened on the drive home, on country roads. I can imagine the tension in the car, my young father at the wheel, the fearsome responsibility of the baby. What if the car got stuck in the snowdrifts? It didn’t, they reached home, stirred up the woodstoves, and the legend began, with its happy ending. So here we are again with an April snowstorm just when everybody is desperate for daffodils! We all always say that springtime snow won’t linger long on the ground. Let’s try to believe that, even if we know better. 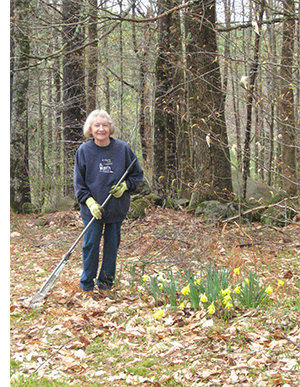 Today’s online Sandwich Board list of events includes an announcement of a series of gardening programs presented by the New Hampshire Master Gardeners starting on April 12. Let’s at least be gardening in our minds. To me the funniest springtime moment so far has been the sight of Don standing in the backyard looking down at a chickadee who had alighted on the lawn near his feet. The expression on Don's face was benevolent and when he spoke to the tiny bird his tone was affectionate, but his words were: "You stupid #%*#." As he well knew, however, the chickadee was very smart, remembering that Don's presence in this location near the lilac bush and the bird-feeder pole usually meant a refill of the bird feeder. We've taken down the feeder because the bears are awake, but the chickadee was checking, just in case. Here in Sandwich, spring has at last arrived. Where snowplows deposited mountains of snow throughout the winter, there are now only a few dirty white lumps left. Elsewhere, the ground is bare and the grass has suddenly turned green—greener—even emerald in some places. The daffodils seemingly shot up and bloomed in a blink. We are even eating springtime; the chives are up. Phoebes have been nesting in the eaves of our ell since we moved here forty years ago (and who knows how long before that). Now we're watching this year's return and the application of mud above one of the ell windows, the fluttering of wings past the panes. The phoebes get their mud from the beaver pond's banks—and more conveniently from the trench Don has dug across the lawn for the overflow from the cellar's sump pump (another feature of springtime here). We imitate their call back to them: "Phee-bee!" There are always jokes about the noise in the country, about how people from "away" can't stand the racket of the damn birds and brooks or about how others can't stand the boring quiet. We've got both going on. Sometimes when we sit on the porch we become aware of spells of silence so complete that we realize how rare it is. Other times we start laughing over the love song of the little frogs called spring peepers as they seek romance at the tops of their lungs, the high-pitched pulsing so loud that we brace ourselves against it, a force of Nature.